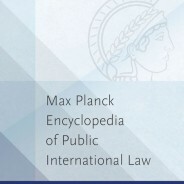 The Max Planck Encyclopedia of Public International Law is a comprehensive online resource containing peer-reviewed articles on every aspect of public international law. Written and edited by an incomparable team of over 800 scholars and practitioners, published in partnership with the Max Planck Institute for Comparative Public Law and International Law, and updated through-out the year, this major reference work is essential for anyone researching or teaching international law. Where and when did the history of international law begin? Many scholars have argued about the definitive date and periodisation of certain dynamic developments, let alone which treaties, institutions, and figures have shaped the field’s core doctrines. Indeed, many of our “modern” notions of human rights, rules of war, and sovereignty have origins stretching much farther back than generally appreciated. Hugo Grotius’s publication of De iure belli ac pacis freed international law from some of its theological baggage. The Déclaration du Droit des Gens cataloged fundamental rights and duties. The First Hague Peace Conference of 1899 established the Permanent Court of Arbitration. In an effort to sort through the major developments, we’ve created the brief timeline of the history of public international law below, beginning with the Treaty of Tordesillas in 1494 and running until the Arms Trade Treaty in 2014. Information on events in the history of international law in the timeline above are sourced from Oxford Historical Treaties, the Max Planck Encyclopaedia of Public International Law, relevant book chapters, blog articles, and journal articles. Follow the links in each timeline entry to learn more about the subject. Is there a milestone missing? Share your thoughts in the comments below. Featured image: Réception d’un ambassadeur français à Constantinople, Vanmour Jean-Baptiste (1671-1737). (c) RMN-Grand Palais / A. Danvers. Licensed and used with permission. Oxford University Press is a leading publisher in Public International Law, including the Max Planck Encyclopedia of Public International Law, latest titles from thought leaders in the field, and a wide range of law journals and online products. We publish original works across key areas of study, from humanitarian to international economic to environmental law, developing outstanding resources to support students, scholars, and practitioners worldwide. Make sure to follow us on Twitter or Facebook for developments in Public International Law. Admiralty law of 1063 or “Ordinamenta et consuetudo maris”. A significant piece of work that is missing in the timeline. Maritime dominance is the bedrock of ever great nation.